There is a whole lot more to meal time than I ever initially thought. 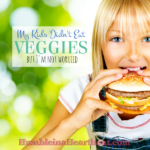 It’s not just about teaching good manners and good eating habits to your kids. It’s also about growing closer as a family. 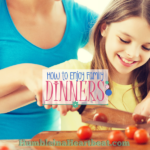 When good food brings your family together, it’s a special time that can affect how your children deal with food, and many other issues, later on in life. The next food rule I’ll be discussing from the book French Kids Eat Everything is that of family meal time and distractions. Rule #4: Food is social. Eat family meals together at the table, with no distractions. We’ve all seen commercials of families sitting around the dinner table, not a one talking to the other, all engaged with their own devices. I don’t know how common that scene is in real life (although this study gives a clear picture of the huge problem it is becoming), but it’s not something I desire for my family’s meal times. Having distractions at the table can be detrimental to family relationships and to good health. I think many of us have issues with keeping technology away from the dinner table. My husband and I are no exception, especially at breakfast. When our girls notice that we are on our phones or tablet, they start acting up. Sofía has even started saying, “put down the tablet!” so I am definitely getting the message! Our daughters are ages 2 and 1, and I know that in less than 10 years time (no, I’ll bet it’s more like 5 years time!) they will both be interested in getting a phone or some other device to stay connected with their friends. Perhaps it’s harsh, but I decided long ago that I would never buy my kids a cell phone. My parents didn’t buy me one, and I had to wait until I was out of high school before getting my first one. There are several reasons why I won’t buy them a phone, but one of the top reasons is that cell phones are a huge distraction. Another major distraction, at least for kids, is toys. 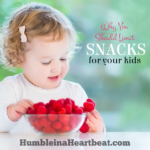 When a child has a toy to play with, the food becomes an afterthought, and he never gets around to eating it unless the parent is pushing food into his mouth. By keeping toys away from the dinner table, children learn that there is a difference between play time and meal time. I’m sure you’ve noticed that when you are in a hurry or you are working on something else while you are eating, you actually end up hungry again just a little while later. Because you weren’t focused on what you were eating, you did not enjoy the food. 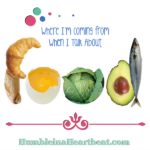 It’s called mindful eating, and you can read more about it HERE. If you want to be healthy, you need to experience the food as you eat it. By eating with distractions, you are setting yourself up for overeating. If you stop and savor the food as you eat it, you will notice that you are fuller much faster, and you will enjoy it way more. 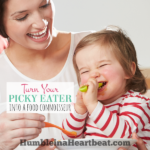 If you do it the other way around and say you will fit dinner time in around all your scheduled activities and meetings, you will find it almost impossible to have a good sit down meal with your family even once a week. It doesn’t have to be dinner where you are all sitting down together to eat. You could also eat lunch or breakfast together if that’s what works best for all your schedules. Just make it a point to eat together often. We’ve thought of putting a TV in our kitchen because we both really enjoy watching cooking shows, but I’m glad we have never actually followed through. I know we would be tempted to keep the TV on during meals, and it would lead to less than satisfying family meal times. Keep the phones, tablets, computers, etc. away from the table. If you are expecting a call, turn off your phone if at all possible and call the person after the meal. Toys are my number one pet peeve at the dinner table. I have never let my daughters play with them and I never will. We don’t go out to eat, but I’m sure if we did, it might be helpful to let them play with toys while we wait for the food, but once the food arrives, the toys would be put away. 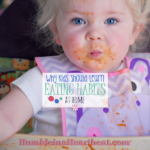 Kids are learning how to eat, so they need to be focused on the food and atmosphere rather than their toys. My daughter loves helping with anything she can for dinner. If I involve her, she will be more excited to sit down and enjoy what she just helped prepare. I think kids should also help with cleaning up the plates and the table after a meal. 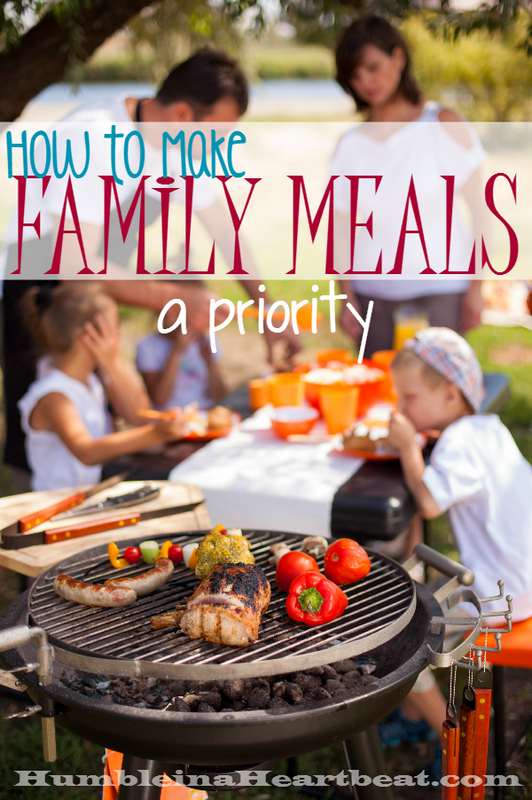 In no way are we perfect at any of these ways to make family meals a priority. However, we are working on them and doing better each time. The best thing we can do for our kids is teach them how to have a conversation over a meal and enjoy their food. We want a strong family, and having meals together is a great way to achieve that. I think it’s important to know the benefits of sitting around the table as a family, so if you’d like to read more on this topic, please click HERE or HERE.